While the brand name Sawtooth may not invoke as much envy among your pals as having a Gibson or Fender, you may be surprised at the quality on offer from this budget starter kit. 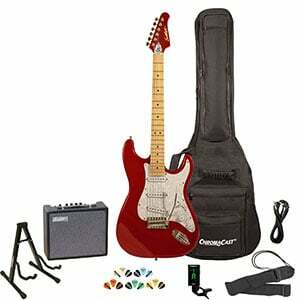 It comes with everything you need to start playing the electric guitar, in a package that feels well thought out. Today, the pack gets its time in the spotlight! Firstly, in this review, we are focusing on the Candy Apple Red model from the ES Series, although there are several different guitars available with this pack. This includes a very attractive Daphne Blue, a retro Vanilla Cream, and a black model with an uncommon chrome pickguard. It’s a surprise to find this kind of choice – and these kind of colors – in this price range, which is a good sign! The guitar features a Strat-style double-cutaway body, made from solid sycamore, along with a bolt-on maple neck. This is comfortable to hold and friendly for beginner hands, while the maple fretboard offers a total of 22 medium jumbo frets, all nicely dressed and quite accessible thanks to the cutaway. As for hardware, this is basic but functional, comprising chrome tuners and a tremolo bridge (with accompanying whammy bar). The electronics are standard for a guitar in this range, with a trio of simple single-coil pickups, two tone knobs and a master volume control, as well as a five-way pickup selector switch. For an affordable guitar, it looks great and the quality is more respectable than some others in similar price ranges. In particular, the finish is lovely and the matching painted headstock offers a higher-end touch. As with many entry-level guitars, this Sawtooth electric would benefit from a string change and a bit of a setup on arrival, yet it plays very well straight from the box – just tweak the tuning and you are good to go. Sticking with the theme of ‘simple but functional’ we move onto the hardware. The basic 10-watt amp that comes with the kit provides good volume, but it is a little disappointing in its tone. This would be the first piece of equipment that you’d want to upgrade. It’s the included gig bag that takes center stage here, with a padded construction and several pockets for storage. The rest of the bundle comprises a decent clip-on digital tuner (essential for beginners! ), as well as a strap, a cable, an A-frame guitar stand, and a good selection of picks. Overall, there’s not much to complain about when it comes to this bundle. Sure, the amp is a bit basic, as are some of the accessories, yet the stylish guitar alone is worth the affordable price. The fact it comes with a good-quality gig bag and some extras just boosts the value and proves that Sawtooth is still a better option than a generic ‘no name’ guitar. For more info about the Sawtooth ES Series Bundle, click here. For more electric guitar starter packs, click here.